These two pictures show what a dramatic improvement pressure washing a driveway can make. It was very hot when I pressure washed this driveway so I first cooled off the concrete with a quick mist of fresh water. The next step is to apply our cleaning solution which includes bleach and a detergent. After allowing the cleaning solution to soak for about ten or fifteen minutes, I begin pressure washing using a surface cleaner. Once a section is pressure washed, I switch back to my lance and rinse all the dirt and mildew from the driveway. That’s all there is to it! 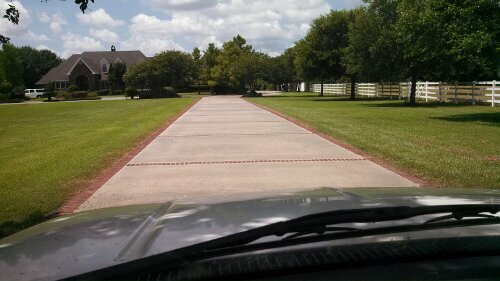 This was an extremely long driveway and the largest driveway I have ever cleaned. 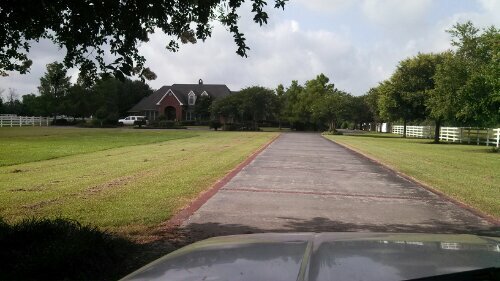 It took me a just over a day to complete this driveway pressure washing in Lafayette, La. Want to see your driveway in a new way?